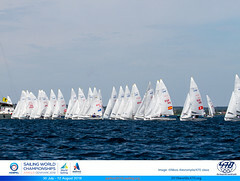 Day three of the 470 World Championships off the Royal Danish Yacht Club’s club house in Rungsted, Denmark and it is the Dutch who are stealing the show. Having sailed three races yesterday, today has been a comparatively short one with just one to sail, the final of the qualifying series. The Costers brothers went into today’s racing joint leaders with Croats Fantela and Marenić, and came first in the yellow group, their third bullet out of six races. They now have now pulled into the lead of the Men’s division at the end of the qualifying round. “It is nice to be right up there,” enthused Sven Coster. “We had a good start at the committee boat and we played the right shifts and we came in with more pressure.” Today with the course set more offshore, the current was less of a factor, he says, although counter current on the windward legs made for a long race. Brother Kalle added: “There was a lot less pressure on the left side of the course, so the guys who were stuck out there really lost out a lot on their first beat.” However the Coster brothers, 10 year veterans in the 470 class, are well aware that it is early days yet at this regatta, with three days of Gold fleet racing starting tomorrow, prior to Saturday’s medal race. As to the reason for their success, they say that their gear is identical to what they used in Beijing and they have had time off. “We learned a lot last year and we made a good evaluation after the Games. Then we quit for eight months and we came back together in Hyeres, where it was tough - we were 25th. Everyone else had trained a lot and we hadn’t obviously." 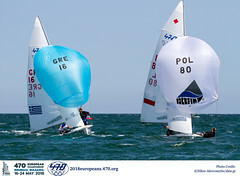 The Costers now hold the lead on eight points, three ahead of Austrian duo Matthias Schmid and Florian Reichstaedter, the ISAF no12 ranked in the 470, who are definitely punching above their weight at this regatta, having been on the podium in every race so far save for a 14th in the first. Two points further adrift are yesterday’s joint leaders, Fantela and Marenić who posted a seventh today, and Swiss duo Matias Bühler and Felix Steiger, who were sixth today. While the Costers top the men’s class, so their fellow Delta Lloyd-backed team mates Lisa Westerhof and Lobke Berkhout hold an even greater lead among the women, posting a fourth place today bringing their tally up to 10, seven points ahead of three teams vying for silver on 17. So is it coincidence that two Dutch teams are leading? “I don’t know,” says Sven Coster. “We don’t train together, but we have trained a lot together in the past and they are, I know for sure, the best girl’s team.” “A very talented team,” his brother nods in agreement. Among the three women’s teams chasing the Dutch are the Australian gold medallists from Beijing, Elise Rechichi and Tessa Parkinson. All three Australian women’s teams competing had relatively good results today, Rechichi and Parkinson. finishing third with Stacey Omay and Chelsea Hall fifth. 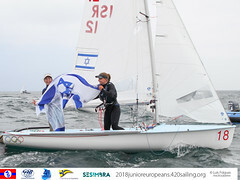 Rechichi and Parkinson are tied on 17 points with the 2009 European champions, Guilia Conti and Giovanna Micol from Italy and the brand new British pairing of Pippa Wilson, the Yngling gold medallist from Beijing, and Saskia Clark, who was 6th in the 470 in China last year. Clark’s Beijing helm, Penny Clark, now racing with Katrina Hughes, was second overall yesterday, but a 15th today has dropped them to 9th. The other winners in the Men’s class today were Spain’s Onan Barreiros and Aaron Sarmiento, now 22nd overall, and the top US team, Stuart McNay and Graham Biehl, present leaders in ISAF’s Sailing World Cup, who lie tenth. “We got a good start and we were able to follow people in the right direction,” McNay recounted of today’s race. On the penultimate leg they overtook the New Zealanders Paul Snow-Hansen and Jason Saunders to add a welcome win to their score-line. Tomorrow the teams will be divided into gold, silver, bronze fleets for the men, gold and silver for the smaller women’s class. Weather-wise a cold front is expected to pass across Denmark tonight and with it a shift to the dreaded west, an offshore breeze, that with the northerly flowing current will make the racing especially challenging.